Metropolitan His Grace Dr. Thomas Mar Makarios, a native of Kerala, India, was born on May 26, 1926 to Mr. Chacko & Mrs.Mariamma Kuttikandathil. After attending schools and colleges, he decided to join for theological studies at the Orthodox Theological Seminary in Kottayam. 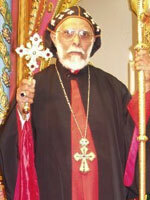 In 1952, he was ordained as a Priest by His Holiness Catholicos Geevarghese Baselios I. Afterwards he came to India's capital of New Delhi where he organized congregations in North Indian cities, in which ultimately he became the first Vicar of the Indian Orthodox Church in New Delhi. It was during the time of the litigation of the Church that the Metropolitan as a young priest, showed his ingenuity as leader and scholar in Church History. He helped the lawyers of the Church understand the history, Traditions and Canons of the Church. This was instrumental in seeking an historic verdict by the Supreme Court of India in favor of the Church in 1958. He has also studied in various religious institutions in England, Germany, Switzerland and France. He has been in the U.S since 1963 and earned a Bachelor of Divinity degree from Nashota House in Wisconsin, a Master's of Sacred Theology from Virginia Theological Seminary, and a Doctorate in Theology from Union Theological Seminary in Richmond. He returned back to India and worked as a professor of Church History at Orthodox Theological Seminary in Kottayam. In 1975, Fr. Thomas was consecrated as Metropolitan Thomas Mar Makarios by His Holiness Catholicos Augen I. In that same year the Catholicos appointed Metropolitan Mar Makarios as the first Metropolitan of the Bombay Diocese. In 1994, His Grace Mar Makarios was appointed as the first Metropolitan of the newly created Canada & Europe Diocese. His Grace Dr. Thomas Mar Makarios passed away on February 23, 2008 as a result of a tragic car accident in e arly January 2008 during his archpastoral visit to his diocese in the United Kingdom. May the memory of Metropolitan His Grace Dr. Thomas Mar Makarios be eternal!